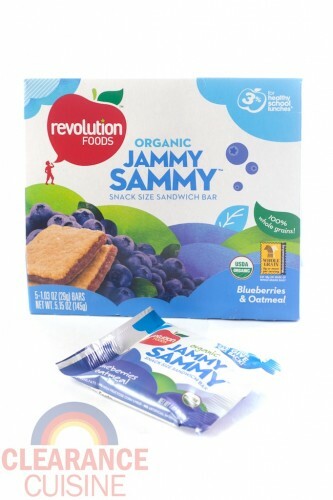 While they’re more like a Nutrigrain bar that an actual sandwich, Organic Jammy Sammy snack size sandwich bars are everything a Whole Foods shoppin’ mom would want for their kid: organic, no trans fat, no high fructose corn syrup, whole grain, wheat free and colored with things like “red cabbage extract”. Revolution Foods even has marketed this snack to the pickiest of kids. In addition to all the fancy-schmancy non-artificial ingredients (things like “red cabbage extract” instead of the standard coloring), they were even mindful enough to cut off the crusts, lest any child complain. The problem is so serious, we’ve developed entire product line to combat the issue. As someone who grew up eating the aforementioned Nutrigrain bars, these little buggers are a fair contender. They’re square, smaller and don’t that that dreaded extra crust so there’s more fruit filling per square inch. While blueberry isn’t my favorite flavor in the world, the moist innards combined well with the oaty outside (I’d take a chance on trying the apple or strawberry ones). 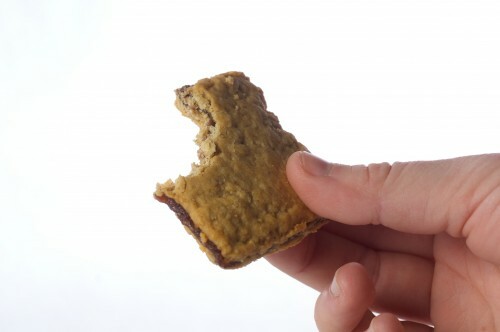 Since the bars use agave nectar instead of corn syrup, they’re still quite sweet. However, since they were cheap and they’re manageable enough for children’s hands (as well as mine) they’re a decent snack that’s easy to stash for snack time and won’t make you feel too terribly guilty when you eat it either. Fits perfectly in my small childlike hands. This entry was posted on Monday, April 18th, 2011 at 8:00 pm	and is filed under Food. You can follow any comments to this entry through the RSS 2.0 feed. Both comments and pings are currently closed.